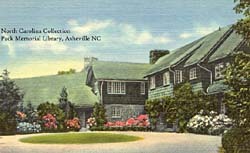 In-the-Oaks, located in Black Mountain, North Carolina, was originally built as the grand estate of Franklin Silas Terry and his wife, Lillian Estelle Slocomb Emerson. Historically spelled Intheoaks, the estate was named after the oak leaf in the Slocomb family coat of arms. In-the-Oaks was one of the last of the grand estates built between the coming of the railroad to western North Carolina in 1880 and the Great Depression. This was a period of building large, extravagant residences designed by some of America's most notable architects. Designed by the New York architect Frank E. Wallis, the estate was constructed between 1919 and 1921 and included more than 240,000 square feet. Built on 80 acres, the building cost was later placed at $600,000. A grand rambling two- and three-story mansion, the estate was "an authentic reproduction of a Tudor country manor." In 1923 New York architect Francis George Hasselman completed a large recreation wing, designed by Asheville architect Richard Sharp Smith. Franklin Terry was an industrial giant whose little Ansonia Electric Company surpassed others in the highly competitive market to extend the burning life of the light bulb. Terry ultimately became the first vice-president of the emerging General Electric Corporation and was a recognized leader in the electric industry until his death in 1926 at age 64. Following the death of Franklin Terry, his wife continued to live at the estate until her death in 1956. 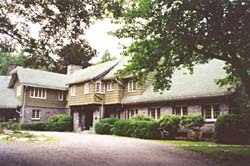 The Terrys' daughter, Mrs. Lillian Boscovitch, donated the property to the Episcopal Diocese of Western North Carolina in 1957. After receipt of the property, the church established Camp Henry for young people. The camp operated successfully for 39 years, hosting thousands of children for summer camp as well as private conferences for adults. Dr. Martin Luther King, Jr., and Andrew Young used the seclusion of In-the-Oaks for a leadership meeting of the Southern Christian Leadership Conference on January 20, 1967. Today, In-the-Oaks is owned by Montreat College and is a second church home to many North Carolina Episcopalians. The retreat is so popular that conference weekends are often reserved a year in advance. In-the-Oaks is located off Hwy. 9 on Vance Ave. in Black Mountain, 15 miles east of Asheville. For more information call 828-669-8012 or visit the college's website .